The Indy 500 prompted me to search the history of the great race and I found this great image on the Bogan Racers page. The page was built by Bill Bogan as a tribute to his father Bob Bogan. 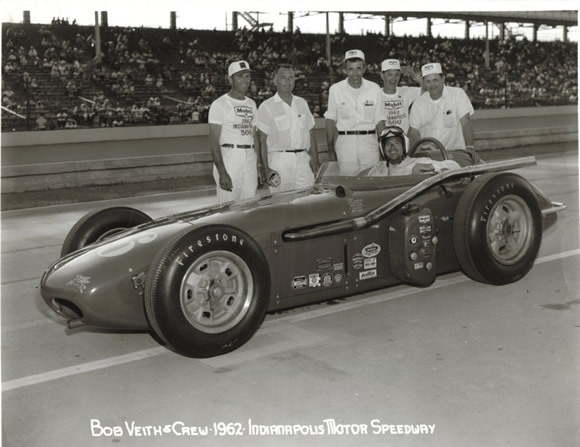 The website is a great history of Bob's involvement in Open Wheel racing. The car above is the Ray Crawford roadster designed and built by Edgar Elder and driven by Bob Veith. All it says is they qualified to run. I am wondering if Scott Dixon et al would have been keen to drive one of these. Probably. Love the fuel cell on the outside of the car under the open exhaust. Hi, thanks for the props. The container on the outside under the exhaust wasn't the fuel cell, but the oil tank - partially for cooling, but I imagine it also moved weight to the left for cornering - however little it is, it helped some. They qualified for the race, I seem to recall they lasted about 14 laps before something broke and put the car out of the race. I still recall the nights when Edgar and his wife would stop by for Pinochle with my folks and, of course, bench racing. That heaps for the comment. Really appreciate the correction, memory of the race and your memories of Edgar and your folks. Having the oil out there to cool it a bit and the extra weight makes sense. Shame they only made 14 laps. Beautiful car. And your dad was really instrumental in open wheel racing. Amazing history.